It was late afternoon, and the unremitting sun was finally replaced by an early evening cast. There was a teenager along one of the manmade lakes feeding large carp with bread she had crumpled in her hand. Further down, “Uptown Funk”, the ubiquitous song of the summer, was playing over a loudspeaker, and a woman dressed in Olivia Newton-John inspired aerobics clothing led a crew of senior citizens into a Zumba routine. As we walked passed the Zumba class, on our way back to the hotel, we realized that the woman leading the group, was, in fact, a man. As the evening crept up, there was, of course, the smell of seared meats wafting in the air. This was the scene at Lumpini Park and scenes we had gotten accustomed to and grown to love about Bangkok. We felt at home in this city. It wasn’t hard to find our way back to where we were staying because perched up on a hill was Bangkok’s Landmark Hotel, The Dusit Thani. It was once the tallest structure in Bangkok, and the first 5-Star luxury accommodation. It broke ground the same year I was born, 1967 and opened the year my wife was born, 1970. Just the other day, our daughter called her grandmother to tell her of her trip to Bangkok. Inquisitive, her grandmother asked what her favorite part of the trip was. Without hesitation, she replied, “The Dusit Thani”. Her grandmother, a choral conductor by trade, replied loud enough that we could hear it through the receiver, “The Dusit Thani!, I stayed there many moons ago. That place is so beautiful”. After the conversation, my daughter hung up and turned to us and quipped, “Ama (grandmother) was a hotshot”. Many dignitaries and rock stars have stayed here throughout the years, which apparently included my mother-in-law. No wonder we felt so at home. There were all of these connections. Not to mention that our Dusit Suite was sumptuously appointed with the bedroom separated from the living area, with a large bathroom and adjacent dressing room. The view was second to none and everything kept at the highest standard, no streaks on the windows found here. There was everything we needed for a luxurious stay, from bathrobes and slippers, to endless bottles of mineral water and daily replenishments of high-quality shampoo, conditioner, toothpaste, toothbrushes and lotions. Owning an online business, the addition of high-speed internet was a plus. There were plenty of channels to flip through on 2 cable ready televisions which were great, as I was able to catch up and watch all the sporting events I had been missing from back home. The daily fruit basket and newspaper was also a welcomed addition. There is 24-hour Room Service and a Mini Bar, but we opted to have a few drinks at 22 Kitchen and Bar instead. The bar overlooked the Bangkok skyline and at night it looked beautiful. The evening we were there was Halloween and they had Ladies Night (which meant my wife drank for free) and Drink Specials for the paying gentleman. They were also family friendly as they had a face paint artist on hand for the children. This is certainly a wonderful surprise as children are usually made to feel uncomfortable in lounge settings. Not here, they were part of the party and a wonderful party it was. Pursuant to a few drinks, we had dinner at their in-house Modern Thai Restaurant, Benjarong. The staff was on point, the temperature in the restaurant just right, and the food excellent and kept very authentic. Our favorite dish of the evening was their Spicy Kobe Beef Salad. Let’s just say, they didn’t anglophile the heat. They also had a great wine list. We had a Barbera D’Alba that evening, which we welcomed as we hadn’t had a good glass of wine in these parts. This 2004 vintage was exceptional. The next couple of days following, we enjoyed having the buffet breakfast which had a nice mixture of Western and Asian fare. The convenience of being on Silom, one of Bangkok’s main thoroughfares made life easy. Public transportation, both MRT and BTS train lines intersected here, there was also a popular mall nearby and endless street food options. Most of all, we enjoyed the room and the hotel’s facilities. My daughter relaxed while watching television in her robe, my wife had good workouts at the gym, and I had beers poolside. Upon checking in you are given a garland of fragrant white blossom which emanates throughout the lobby and makes for a relaxing first impression and a gentle last impression when you leave. 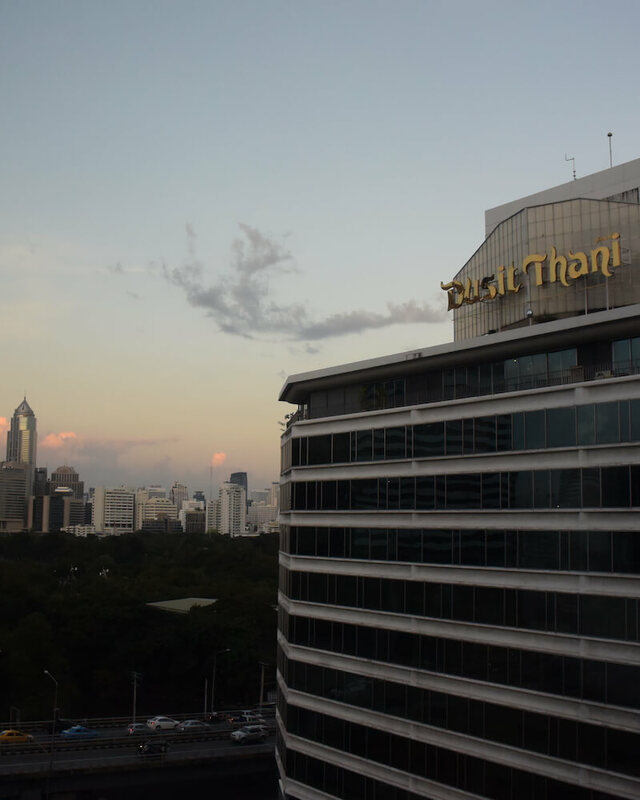 The Dusit Thani’s slogan is, “Using the Gifts of Heaven to Create Heaven on Earth”. Not sure if everything in the hotel came from heaven, but they sure made you feel like it did. That’s Bangkok for you. Thank you Sommai and the Dusit Thani for hosting us. It was a lovely stay. Words and thoughts, are our own. What a great story. That was such a fun read. Thank you, Ruth. Can’t wait to hear your perspective.